Program supervisor Marina and shelter employees at the 25th anniversary barbecue. Safe shelter for thousands of adults and children, hundreds of families fed and supported and a countless crises averted and transformed into positive outcomes – that’s the 25-year legacy of Fraserside’s Emergency Family Shelter. The 12-bed shelter is celebrating 25 years of serving families and connecting them with community services this month. 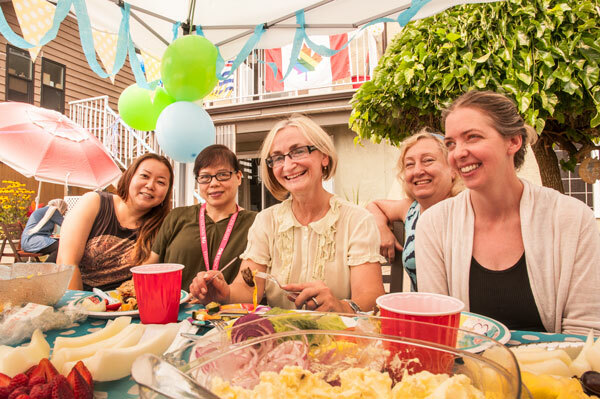 Precipitated by an apartment fire in New Westminster that left many families suddenly homeless, the shelter is a friendly temporary safe haven for single parents (men or women and their children), two-parent families and single adult women. “Year after year the emergency family shelter meets the needs of families in crisis,” said Lynda Edmonds, Fraserside Community Services Society's CEO. Refuge families recently became the largest group needing the shelter’s services. These new arrivals in Canada often face language and legal challenges that the Emergency Family Shelter helps them overcome. The shelter, located in a large home in central New Westminster, is operated by program supervisor Marina Vereschagin and her staff. Last week Marina and the shelter employees provided a 25th anniversary barbeque for the shelter guests and Fraserside leadership.